In January, 1892, there was a stagecoach holdup out of Globe. King Usery and Henry Blevins held up the Globe-to-Florence stagecoach (traveling the Howard and Reduction Toll Road) at Cane Spring in the Dripping Spring Mountains, just south of the Pinals. They netted two bars of silver bullion at $1500 each, a dozen gold breastpins at $20 each, and six gold eardrops valued at $90, as well as $200 cash. Usery was convicted and served some time in the Yuma Territorial Prison but the jury wasn't sure about Bevins. The lawyers of the two men were paid in cattle for their retainer fee. As it turned out, both Usery and Blevins then stole back their cattle from their lawyers, claiming that the fees were too high. This time both men were convicted and sent to Yuma. 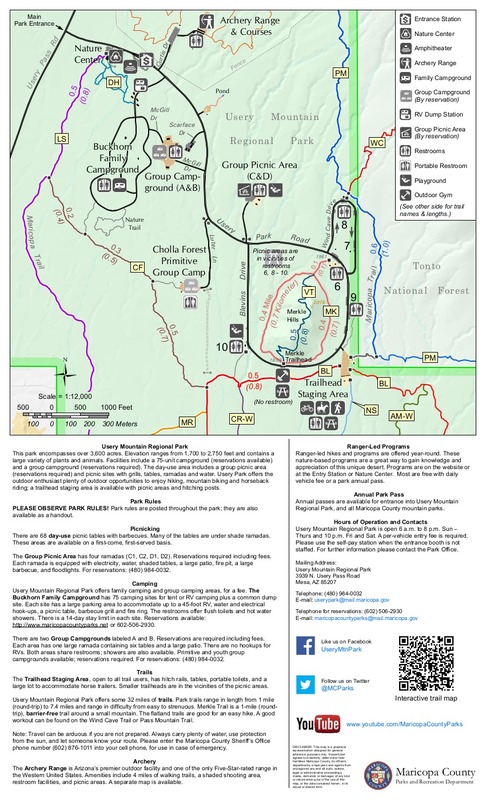 Enter the Usery Mountain Regional Park for an adventure on the Blevins Trail. This loop trail is well suited for hiking, jogging, mountain biking, walking your dog or horseback riding. Access from within the park can be had at either trailhead off Blevins Drive. Be sure to ask for a map when paying your entrance fee. 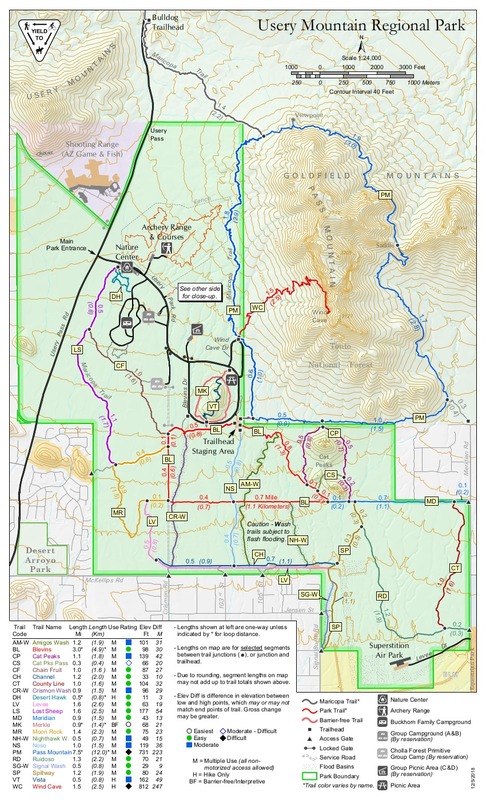 You can avoid an entrance fee by using any trailhead off Meridian Road north of Brown and using one of the many connector trails to get to Blevins. The Usery Park has nice facilities for a cross section of people to enjoy. A covered playground for children, covered picknic tables and bar-b-que grills encourage you to make a day of it.. The Blevins Loop has mild elevation changes and passes through several washes. The area contains a large variety of plants and animals representing the Sonoran Desert, and is particularly beautiful in the Spring. "Scarface", the large mountain looming to the north is Pass Mountain. To the east are - Cat Peaks - and far off to the east are the Superstition Mountains. On a clear day you can spot Picketpost Mountain to the Southeast and Picacho Peak and the San Tan Mountains to the south. The trails are well groomed and not rocky for the most part. Smooth crushed gravel and sand make for easy going. The views are consistent with the mature vegetation taking center stage. The trail is well marked with one exception. The southwest corner where Blevins becomes the Moonrock trail is where you should turn north. If you are going clockwise just after you cross Crismon Wash, which is marked, in another 100 feet, the trail is marked Moonrock Trail. Turn right here for the Blevins Trail. Going straight ahead will bring you around and rejoin Blevins but add 1.3 miles to your trip. As for the entry fee. It is money well spent. The trails are maintained regularly and not a speck of trash is to be spotted.